PROIBIDÃO is the name given to a certain kind of electronic funk music produced in Brazilian favelas, especially in Rio de Janeiro where it started to appear in the beginning of the 90’s as a parallel phenomenon to the growth of drug gangs along the city’s more than 600 slums. A raw mix of live funk vocals and Miami bass structures, these anonymous funk tracks are spread illegally by DJs and gang sponsored parties. Proibidão is a raw musical genre that captures the dark side of Brazilian favelas. The explicit lyrics of apology to drug gangs and the violent content makes them illegal to broadcast through radio or as live public events. Proibidão can only be heard in the bailes or dances that the gangs organize and that run every day of the week in different locations in the slums around Rio. The production of a Proibidão occurs in different ways. A DJ spins Miami bass rhythms straight from sample CDs, and an MC talks on top of it, mainly live in street bailes and then recorded through a simple multichannel to a minidisk or simply straight. No mix is done and only sometimes an extra production is done. The gang leaders, to spread the respect and love for the gang as well as hate to the other gangs, finance the bailes and hire the DJs and sound systems. At most parties this is recorded live and spread then as an mp3 or CD to different other DJs and bailes. Its life runs a minimum of 6 months and depending on it’s popularity it can go on for more than one year. The selection featured on this CD compiles music recorded live during the beginning of 2003 in different favelas from Zona Sul, South Rio de Janeiro, a zone once controlled by the drug gang called Comando Vermelho, mainly responsible for the city’s growing rates of homicides and power corruption, as well as Rio’s and Brazil’s growing drug consumption. C.V Comando Vermelho (Red Command) is a criminal organization that was founded in 1979 in the prison Cândido Mendes, on the island Ilha Grande (RJ), as a connection of common prisoners and militants of the Falange Vermelha (Red Phalanx), which fought the military dictatorship. During the entire 1990's the criminal organization was the strongest in all of Rio de Janeiro, but today the principal leaders have been arrested or are dead, and the organization is not as strong. The Comando Vermelho still control parts of the city and seeing streets tagged with "CV" is common in many favelas in Rio de Janeiro. This CD is in no way an apology for these groups but a document to portray a moment in time in Rio de Janeiro musical and social history. All audio imperfections are left as they were when collected as these tracks are the only remaining documents of this music. 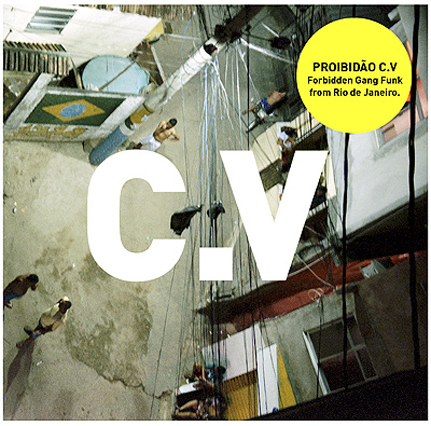 Recorded and assembled by filmmaker Carlos Casas courtesy of some anonymous MCs and DJs in different bailes along the favelas of Zona Sul, Rio de Janeiro during March-April 2003.